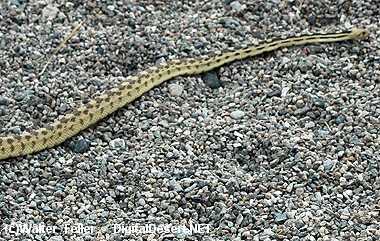 This gentle and easy-going snake can be found throughout Mojave Desert. It’s pattern is similar to a rattlesnake and is often mistaken as one and unfortunately killed. It may be yellowish or cream colored and have brown or reddish blotches along the back. It is a very large and powerful snake and occasionally reaches 6 feet in length. Females lay up to 15 eggs in loose sand in April/May with young being born at about 8 inches. It lives over much of the desert in rocks, sandy washes and is a skilled climber. Its prey consists of rodents, rabbits and lizards and it kills its prey by constriction. This snake is very gentle and normally easy to handle. The gopher snake is California's most widespread and common snake. Gopher snakes are found thoughout California, including the Channel Islands, and are absent only from the high mountains of the Sierra Nevada. They are found in all habitats and are generally absent only from densely forested habitat stages in the Sierra Nevada. Elevation range extends up to 2740 m (9000 ft) (Stebbins 1985). Feeding: Adults take chiefly mammals and birds while foraging in mammal burrows, on the ground, or in shrubs. Stebbins (1954) listed mice, kangaroo rats, gophers, ground squirrels, rabbits, quail and ducks and their eggs as among the food items reported for gopher snakes. Juveniles take young mice and small lizards. Prey is killed by constriction. Cover: When inactive, gopher snakes seek cover in rodent burrows and under surface objects such as flat rocks, logs, and boards. At high elevations with long cold winters, individuals hibernate, often with other species of snakes, in rodent burrows and in deep rock fissures. Reproduction: Eggs are normally laid below the surface in stable rock talus, in abandoned mammal burrows, and in loose moist soil. Water: No information on water requirements. 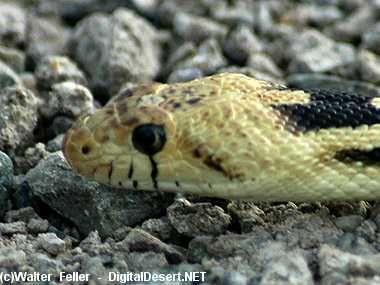 Gopher snakes are common in arid and semi-arid regions. Standing water is not an important habitat element. Pattern: Prefer sparse and open grassy stages, less common or absent from denser forested habitat. Activity Patterns: Gopher snakes may be active on the surface whenever temperatures are favorable. During the cooler periods of spring and fall most activity occurs mid-day, but when summer days are hot most activity is restricted to early morning and late evening hours. Seasonal Movements/Migration: Predictable seasonal movements have not been reported for ths species in California. In Utah, however, gopher snakes make annual movements to and from known hibernacula (Parker and Brown 1973). It is probable that this also occurs at inland montane localities in California. Over much of the rest of their range in California, gopher snakes spend periods of winter inactivity in or near the areas of their warm-season activity. Home Range: The nature of the home range of California gopher snakes is not well known. In southern Idaho, Diller (1981) estimated gopher snake density at 1.3 snakes per ha (.52/ac). Territory: The nature of territoriality in this species is unknown. "Combat" between males has been observed during the breeding season, sometimes in the presence of females (Hansen 1950, Shaw 1951). Reproduction: Clutch sizes range from 3 to 18 and average about 7 or 8. Eggs are deposited in June and July after the courtship period, which extends from March to May. Communal nesting has been reported (Brodie et al. 1969). Hatchlings emerge in the fall and may not feed until the next spring. Niche: Because of their activity patterns and abundance, gopher snakes are taken by a wide range of predators including mammals, predatory birds, especially hawks, and other snakes. The nature of the competitive interactions with other species of snakes is unknown. It has been suggested that the behaviors and color pattern of gopher snakes mimic those of rattlesnakes (Gordon 1939, Kardong 1980). Brodie, E. D., Jr., R. A. Nussbaum, and R. M. Storm. 1969. An egg-laying aggregation of five species of Oregon reptiles. Herpetologica 25:223-227. Diller, L. V. 1981. Comparative ecology of Great Basin rattlesnakes (Crotalus viridis lutosus) and Great Basin gopher snakes (Pituophis melanoleucus deserticola) and their impact on small mammal populations in the Snake River Birds of Prey Natural Area. Ph.D. Disser. Univ. Idaho, Moscow. 89pp. Gordon, K. 1939. The Amphibia and Reptilia of Oregon. Oreg. State Monogr., Studies in Zool. No. 1. 82pp. Hansen, R. M. 1950. Sexual behavior in two male gopher snakes. Herpetologica 6:120. Kardong, K. V. 1980. Gopher snakes and rattlesnakes: Presumptive Batesian mimicry. Northwest. Science 54:1-4. Parker, W. S., and W. S. Brown. 1980. Comparative ecology of two colubrid snakes, Masticophis t. taeniatus and Pituophis melanoleucus deserticola in northern Utah. Milwaukee Pub. Mus. Pub. Biol. and Geol. No. 7. 104pp. Shaw, C. E. 1951. Male combat in American colubrid snakes with remarks on combat in other colubrid and elapid snakes. Herpetologica 7:149-168.